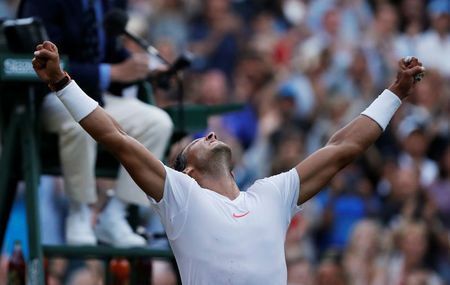 It doesn't get much more dramatic than this - eight-time champion Roger Federer crashing out of Wimbledon at the hands of Kevin Anderson after leading by two sets and having a match point and Rafael Nadal and Juan Martin del Potro contesting a five-set thriller of their own on Centre Court. Relive all of the action of men's quarter-final day with the best photos, reactions, quotes and highlights below! 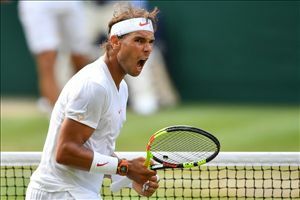 LONDON - When the 4 hours, 48 minutes of diving across the grass and leaping into the stands, of slipping and sliding, of so many moments of great tension - and, above all, great tennis - were done, when Rafael Nadal had sealed his Wimbledon quarterfinal victory, the man he edged, Juan Martin del Potro, was face-down at a Centre Court baseline.